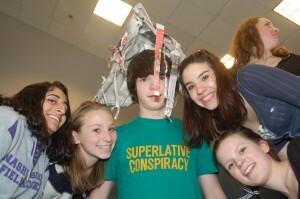 The goal of Destination Imagination is to help students learn how to apply their creativity, while building teamwork and learning problem-solving techniques. These life skills are a distinct advantage in any field that the student eventually chooses to pursue. Each year, NH-DI provides training workshops for Team Managers, Appraisers, and team members. Are you a Team Manager? If so, NH-DI’s training will help you learn how to work with your team. They’re a fun way to learn new things that you can also apply at work and at home. In our New Team Manager Workshop, we will walk new Team Managers through everything that they need to know in order to have a successful season! We offer this training workshop twice each season, once in the early fall and repeat it a few weeks later. In January, NH-DI holds its annual DIve In workshop for teams (formerly known as Instant Combustion). Your team can join hundreds of other kids from all over NH for a day of workshops, Instant Challenge practice, and more. Times and locations for upcoming NH-DI sponsored events can be found on our Calendar of Events page. If your team would like to attend our DIve In workshop for teams, please visit the DIve In registration site. For Team Manager training, the preferred registration method is to visit NH-DI Online. You will need to log into your existing account, or create a new account by clicking on the link on the login page. To sign up, go to https://www.nh-di.org/online, log into your existing account or create a new account. Bring up the Teams menu, and select the register for event menu pick. You will see a section labeled My Event Orders that lists your existing event registration orders, and a section labeled View or Add Upcoming events which lists upcoming events (if this is empty, it’s because there are no events for which registration is currently open). Click on the link for the event, and a page will appear with instructions on how to register. Team Manager training is offered on more than one date, so please make sure you click on the link for the correct date..
For the New Team Manager Workshop: Whether they are managing a Rising Stars team or a competitive team.